Namaskar and welcome to this episode of the Master Builders of India. During the 18th century, India witnessed a period of sustained political turmoil. The central authority of the Mughals was declining, while a number of European trading companies were gradually assuming political character. There was a general scramble for power. The old order was changing, giving place to the new. The earliest buildings of these European colonial powers in India were the warehouses, barracks, residential quarters, arsenals etc. which were strategically separated from the local habitat by a fortified enclosure. These buildings were erected to serve utilitarian purpose, rather than represent any architectural style. But, with the emergence of the British as the dominant colonial power, their architecture became established as a symbol of their political identity. The British saw themselves as the successors to the Mughals and sought to present themselves in that way. While much of the British buildings continued to be utilitarian in nature, the British also used architecture in the same way as did the Mughals – as a symbol of power, and this symbol of power was more eloquent at the seats of powers – the British capital cities. Starting in the 1850s, the British began to move the headquarters of their provincial administrations to the nearest hill station. The Madras Government spent six months in Oatacamund (or Ooty), the Bombay Government was four months at Mahabaleshwar and four months at Poona each year, the Bengal Government went to Darjeeling for three months, and the Government of the North-Western Province and Oudh (modern Uttar Pradesh) was in Nainital for five-and-a-half months. In 1864, this practice was extended to the Supreme Government at Calcutta and for six months every year, Simla was selected to serve as the Summer Capital of the British Government in India. Apart from the Government of India, from 1870s, Simla also served as the Summer Capital of the provincial Government of the Punjab. As the Imperial Summer Capital, a number of buildings reflecting the imperial self-assurance took shape in Simla. During the 19th century diversity and blending of styles was the hallmark of English architecture and these trends prominently feature in the buildings of Simla constructed during that period. The most important and imposing of all imperial buildings at Simla is the Viceregal Lodge. Standing majestically on the summit of the Observatory Hills is the Viceregal Lodge. Now known as Rashtrapati Niwas it is quite befittingly the only building in Simla that occupies a hill by itself. This rambling Scottish baronial edifice bears stylistic resemblance to the English Renaissance architecture. Designed by Henry Irvine, architect in the Public Works Department, it took about three years and 1.65 million rupees to complete. It consists of a Main Block of three storeys and another block, called Kitchen Wing, of five storeys. However, three of the five storeys of the Kitchen Wing are below the ground level of the Main Block, and thus do not belittle it. The masonry of the exterior walls is light blue limestone, and the wrought stonework is all of sandstone of a very fine grain and light gray tint. Very little carving has been used on the exteriors, but whatever there is, it breaks the monotony of the plain span very effectively. A small tower surmounts the Lodge from which the Union Jack once fluttered proclaiming the presence of the British Viceroy of India. This tower houses the water tanks into which the water was pumped from the main supply line of the city. The south facing entrance portico sees the visitor into the reception hall. The hall is marked by a grand staircase, which springs from the right and spirals up all the three floors. Facing the main entrance is the grand fireplace. A gallery with well-appointed teak panelling is the central space of the building around which the other rooms are arranged. The state drawing room, ballroom, and the wood-panelled dining room – decorated with coats-of-arms of former Governor-Generals and Viceroys – lead to the gallery at the lower level. Verandas and terraces surround the entire building at different levels. Those at the lower level link the lodge to the magnificent grounds while those on other floors provide superb views of mountains. Way back in 1888 this Lodge had electric light – when none of the buildings in Simla did – and, would you believe it, an indoor tennis court! The lodge had extensive facilities including huge kitchens; separate rooms for storing table linen, plates, china and glass; laundry; an enormous wine cellar; a room for empty cases; boilers for central heating and running hot and cold water in the bathrooms. Formerly the residence of the British Viceroys, this building was the venue for many important decisions, which changed the fate of the sub-continent. It hosted the historical Simla Conference in 1945. In 1947, the decision to partition India and carve out the states of Pakistan and East Pakistan (now Bangladesh), was also taken here. Of more recent times, was the famous Simla Agreement between India and Pakistan in 1972. After independence, the Lodge remained the summer retreat of the Presidents of India. In the early sixties, the then President of India, Dr. S. Radhakrishnan, a leading philosopher and writer, and the Prime Minister Jawaharlal Nehru decided to make it a scholars’ den where the best minds would find an ideal retreat. 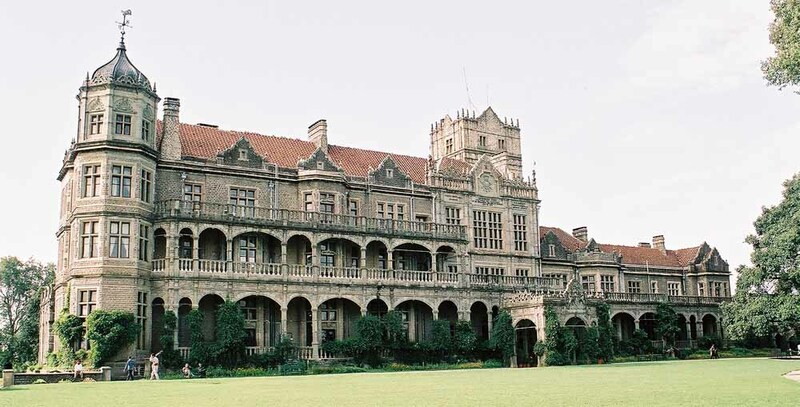 Accordingly, the Indian Institute of Advanced Studies moved into the Lodge in 1965. Some of the interiors had to be changed to accommodate the needs of the Institute. The state drawing room, ballroom, and dining room, for example, have been converted into a library; the Viceroy’s Study is now the Director’s office; and the conference hall is now a seminar room for research scholars. In a magnificent Coronation Durbar held on 11 December 1911 at Delhi, George V, the visiting King of England, announced that Delhi would be the Capital of India. Four days later he even laid the foundation stone for the new capital, before any actual planning had been done. By March 1912, Delhi Town Planning Committee was set up under the chairmanship of Captain George Swinton. The first task before this Committee was to suggest an appropriate site for the new capital. In March 1913, the Committee gave its final recommendation and suggested a site that was not very far from Jantar Mantar, a monumental 18th century observatory built by Sawai Jai Singh II, the Maharaja of Jaipur. Meanwhile the work on layout of various official buildings had already begun, and the Report included a detailed plan thereof. An ‘empire in stone’ was constructed on the hilly mound of Raisina. These buildings included the Government House (renamed as Viceroy’s House in 1929, and as Rashtrapati Bhawan in 1950), the Council Chamber (now the Parliament or the Sansad Bhawan) and the twin Secretariat Blocks (still called North Block and the South Block). This acropolis was the ‘place of Government in its highest expression.’ The focal building of this group was the palatial residence of the Viceroy of India. Designed by the eminent architect Edwin Lutyen, this building was originally scheduled to be completed in four years, but due to intervention of the First World War, from 1914 to 1918, the construction dragged on. It was finally completed after 17 years, in 1929, at the cost of 14 million rupees. At the peak of its construction, over 20,000 labourers and 3,000 stone-cutters worked incessantly to raise this building. Rashtrapati Bhawan has been laid out in ‘H’ shape and it covers a floor area of 200,000 square ft., bigger than the grand palace of Louis XIV in Versailles. The main structure is 640 ft. wide and its sides are 540 ft. deep. Some 700 million bricks and three million cubic feet of stone have gone into building this mega-house of four floors and some 340 rooms of varying sizes. It would take three hours to cover on foot the numerous chambers, anterooms, corridors, courts, galleries, loggias, saloons, staircases and vestibules, not to mention the kitchens, pantries, ironing rooms and theater. The Rashtrapati Bhawan is approached through its eastern side, where a flight of thirty-one imposing steps lead to a columnar portico. There are twenty stately columns – twelve in front and eight behind. On either side of the portico stretches a solid wall, which has two niches each, flanking a recessed verandah having two columns, shorter in height but placed at a higher level. In the middle of these columns is a pedestal, rising above a small rectangular pool. On these pedestals once stood the marble statues of the King George V and Queen Mary of England. Stretching further on the either side of this façade are two loggia which have columnar porticos placed above the three small arched-entrances to the main building. Like the main portico these too have a row of twelve columns each, albeit of smaller size. On the Northern and Southern sides of the main façade, are two blocks of identical size. These have single arched-entrance from the forecourt and smaller porticos with six columns each. The Southern Wing that now houses the Cabinet Secretariat, was originally used as the guest house. The Northern Wing houses the President’s Secretariat. Both these Wings are mounted by roof fountains identical to those that are placed at the foot of the main dome. The most majestic hall inside the Rashtrapati Bhawan is the Durbar Hall. Situated just beneath the majestic dome, it occupies the central position in the building. This hall is designed on the pattern of the Pantheon in Rome. The walls of white marble rise to a height of 42 feet, whence the dome begins to spring, 72 ft. in diameter and 77½ ft. in high. Above it is the majestic dome of the Rashtrapati Bhawan, which is often described as the symbol of sovereignty. It rests on a square red sandstone plinth, which has bastion-like projections of four sides. These, in turn, are mounted by small chatris. Above this plinth rises a drum, which holds the grandiose dome, set in Sanchi-style railing. The top of the dome measures 54 meters above the forecourt. It is faced with copper plates, which has, over the years, acquired dark patina. On the either side of this domical structure are two roof fountains – circular basins, placed on octagonal pedestals, which, in turn, are mounted on square base. A prophetic message from a Master Builder, indeed!! Herbert Baker, was a close associate of Edwin Lutyens. When he was assigned the task of designing a Secretariat building on Raisina, he set out to create, to use his own words, ‘a permanent record of the history, learning and romance of India’. His first project germinated not very far from the master creation of his friend, Edwin Lutyens. Separated from the Rashtrapati Bhawan by a 14 ft. high iron grille is the Government Court comprising the twin Secretariat buildings called North Block and the South Block. Each of the two blocks is about the size of the British Houses of Parliament. Each Block is three storeys high and nearly a quarter of a mile long. The total length of the passages is nearly six-and-a-half miles. 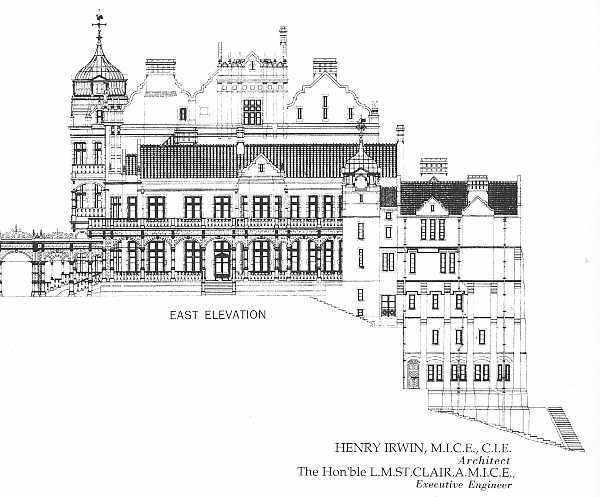 These were designed to contain garages, godowns and records rooms in the basement, officers’ rooms on the ground and the first floor, while top floor was earmarked for the clerical staff. The main entrance to each block is through a rounded arch, which is over two storeys high and is set in a rectangular architrave. Twin arms of each block that stretch out towards the Rajpath, culminate twin red sandstone passage mounted by colonnaded pavilions having 14 columns each. Each block is mounted by a dome which is 217 ft. high from the ground, that is only 21 ft. lower than the Qutub Minar. It rests on a high base that has eight arched openings on the upper portion and is flanked by four small domed kiosks around the lower portion. Each arched opening is bound by twin pilasters on either side, which culminate in a projecting cornice, above which beautifully sculpted elephant-heads are placed. In the North Block the dome sits on a Entrance Hall while in South Block, it surmounts a Conference Hall. The eastern side of the twin blocks has a small towers mounted by small towers mounted by domed cupolas. It is placed in the centre of two colonnaded pavilions that stand on red sandstone passage. The majestic Rajpath dissects the two blocks and travels down the slope of the Raisina hill where it converts into a large plaza. It is rectangle with elliptical ends, 26½ acres in extent. This is Vijay Chowk, from where each year on 26 January, the processional parade to mark the anniversary of Indian Republic commences its journey. This is also the venue of the Beating Retreat Ceremony that marks the conclusion of the Republic Day festivities. 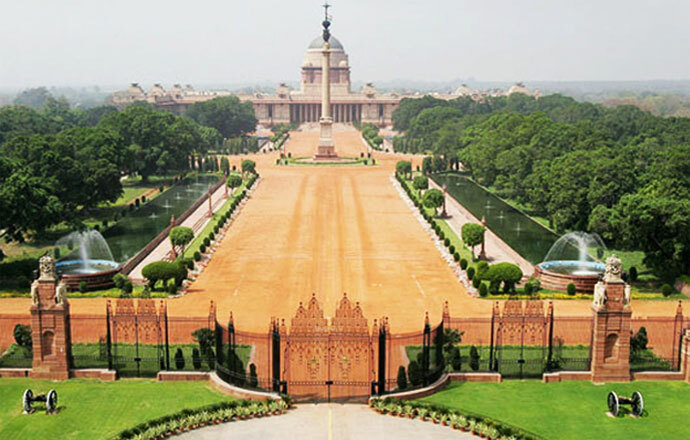 Six red sandstone obelisk fountains, three on either side of the Rajpath, add to the grandeur of this plaza. Ach of these fountains is 240 ft. in length and consists of two circular sheets of water formed by an oblong on a slightly lower level. The plaza is bound by high Sanchi-style railings with three stone gates on either side. Initially the British town planners did not envisage any grand building to house the Imperial Legislative Council. However, by 1919 it became clear to them that constitutional rights cannot be held back from the Indians and that a large Legislative Council was inevitable. Accordingly, in the backdrop of the Government of India Act, 1919, an independent Council Chamber was commissioned. Its foundation stone was laid on 12 February 1921 by the Duke of Connaught. It took six years and 8.3 million rupees to complete. It was inaugurated by the then Viceroy and Governor-General of India, Lord Irwin on 18 January 1927. Designed by Herbert Baker this circular building is located towards north-east of the Rashtrapati Bhawan and the Secretariat Blocks. It is 570 ft. in diameter and is spread over an area of two acres. The circular perimeter is 75 ft. high and is divided into three levels: red sandstone foundation storey, a middle storey grit, abound by 144 buff-coloured columns, each 27 ft. high, and a small attic storey in plaster above the cornices. It has twelve gates, among which Gate No. 1 on the Sansad Marg is the main entrance. Inside the Parliament House, there are three semi-circular wings. All these wings are connected to a circular Central Hall located in the middle of the building. This hall is capped by a dome – 98 ft in diameter and 90 ft. high – and which is crowned by a lantern-shaped cupola. The Central hall was originally used as Parliamentary Library. It was the venue of the sittings of the Constituent Assemble from 9 December 1946 to 24 January 1950. This great hall also witnessed one of the greatest moments in the history of modern India – the transfer of power on the night of 14 August 1947. 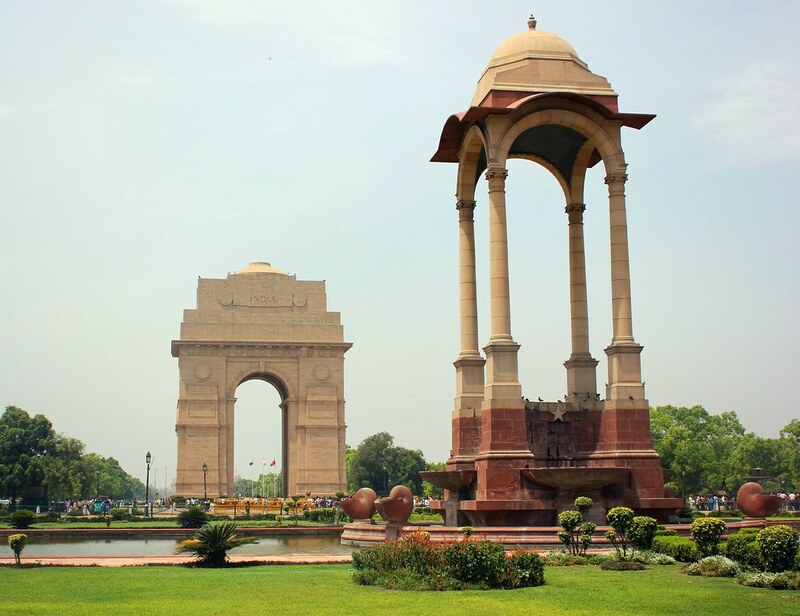 Originally called All-India War Memorial Arch, this 160 foot titanic structure of Imperial Delhi was erected as a solemn homage to sixty thousand Indian soldiers who died fighting for the British. On its walls are inscribed the names of 13,516 British and Indian officers and men, who fell fighting on the North-West Frontier and in the Third Anglo-Afghan War of 1919. This impressive memorial was designed by Edwin Lutyens. Its foundation stone was laid in February 1921 by the Duke of Connaught and it took ten years to complete. Its main opening is in the form of arches set in east-west direction. These arches are 138 ft. high and 30 ft. wide; their inner height is 87½ ft. and the breadth is 70 ft. On the sides, in north-south direction, are two smaller arched openings, each 54 ft. high. These contain giant pinecones placed in urns above the doorways at the bottom. The whole structure is made of buff-coloured sandstone standing on a comparatively low base of red sandstone. As the arch rises from its base to the colossal solid cornice, horizontally projecting lines and vertical recesses break the immense verticality of the structure. Above the cornice is an attic storey, ascending centrally, and mounted by a circular stone bowl that is 11½ ft in diameter. It was intended to be filled with burning oil on great anniversaries and other occasions so that there would be shining flame by night and smoke by day. On the either side of the topmost step word INDIA inscribed on a stone tablet placed in between two circular medallions, which gives it its the popular name – India Gate. Standing some 500 ft. east of the India Gate this vacant canopy, once displayed a white marble statue of King George V, which stood on a high white marble pedestal. Designed by Edwin Lutyens, this 73 feet monument rises on a square base, measuring 20 ft each side. Over this base are four columns supporting graceful sandstone arches. Above it is the projecting cornice and a small dome, complete with stone finial. The whole structure is raised in a circular basin situated in the centre of a square pool. Scalloped basins have been placed in the four recesses at the base. Four beautifully sculpted spiral shells of red sandstone, oozing water in the square pool, have been placed in symmetry with the columnar base. This monument marked the conclusion of the stately King’s Way (now called Rajpath) that originates from the Viceroy’s House, two km west. Viewed through the India Gate, this canopy appears encased in a huge frame. These buildings of the British Raj added a new term to the architectural vocabulary – the Processional or Ceremonial architecture. As for the new capital itself, the name ‘New Delhi’ did not come into vogue until 1926. In fact, the Imperial Delhi Municipal Committee had forwarded three names to the British Government in London – Raisina, New Delhi and Delhi South, of which New Delhi was approved by the King-Emperor himself. The new capital was formally inaugurated on 3 February 1931. Though the foundations of imperial buildings were firm, the empire itself was fast loosing ground. On 15 August 1947, India became an independent nation. The challenges before the country, which was impoverished by the colonial rule, were numerous. The biggest challenge, however, was that of building infrastructure – for economic development, for social welfare and for governance. The architecture of the post-Independence period played a decisive role in meeting this challenge. But that story – of how young dreams and modern ideas of our Master Builders gave concrete shape to ambitious projects of Independent India – we leave to some other time. Meanwhile the architectural past of India lives on rubbing its shoulders with the modern buildings of our time. Every building is like a piece of big jig-saw called Nation, and thus, has a definite societal role to play. Until we meet again, its Good Bye and Jai Hind. Albanese, Marilia. Architecture in India, (2000). Bence Jones, Mark. Palaces of the Raj; Magnificence and Misery of the Lord Sahibs. (London, 1973). Butler, Arthur Stanley George et al. The Architecture of Sir Edwin Lutyens. 3 vols. (London, 1950). Chopra, P.N. and Chopra, Prabha. Monuments of the Raj: British Buildings in India, Pakistan, Bangladesh, Sri Lanka and Myanmar, (1999). Havell, Ernest Binfield. Indian Architecture: Its Psychology, Structure, and History from the First Muhammndan Invasion to the Present Day. 2nd ed. (London, 1913). Havell, Ernest Binfield. The Building of the New Delhi. Guildford, Surrey, n.d., (c. 1912). Irving, Robert Grant. Indian Summer: Lutyens, Baker, and Imperial Delhi. (Delhi, 1981). Lang, Jon. A Concise History of Modern Architecture in India, (Delhi, 2002). Nanda, Ratish, Narayani Gupta, and O.P. Jain. Delhi: The Built Heritage—A Listing, 2 Vols., (Delhi, 1999). Nawrath, E.A. India: Changing Visions, Lasting Images: A Photographic Panorama of Art, Architecture, Landscape and Society During the Raj, Reprint. (New Delhi, 2004).